If earnings reports from JPMorgan Chase (NYSE:JPM) and Wells Fargo (NYSE:WFC) are any indication of what to expect from Bank of America (NYSE:BAC) on Tuesday morning, BAC stock owners have little to worry about. On the other hand, WFC stock has fallen more than a little bit following disappointing full-year guidance. For the quarter ending in March, analysts expect Bank of America to report revenue of $23.30 billion and a per-share profit of 65 cents. For the same quarter a year earlier, the bank turned a top line of $23.27 billion into earnings of 62 cents per share of BAC stock. Wells Fargo and JP Morgan Chase may have already served up glimpses of what to expect from Bank of America’s fiscal Q1 numbers. The company had been modeling net interest income growth to be flat this year, plus or minus 2%. Now Wells Fargo expects net interest income to fall between 2% and 5%. JPMorgan Chase was able to report record levels of revenue and a big earnings beat, largely driven by net interest income growth — which Wells Fargo seems unable to achieve. JPMorgan’s interest-driven income grew 8% year-over-year on the heels of higher rates. Consumer & Community banking revenue grew 9%, while Commercial Banking’s top line was up 8% year-over-year. Net interest margins were up to 2.5%. JPMorgan Chase did have a couple of weak spots though. Corporate & Investment Banking revenue was off to the tune of 6%. On Monday, however, Goldman Sachs (NYSE:GS) posted Q1 results that hinted at headwinds on multiple fronts. Trading, in particular, was soft, spurring the bulk of the 13% decline in total revenue. Fortunately for owners of Bank of America stock, however, the crux of B of A’s business is traditional banking services aimed at consumers. 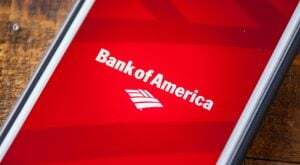 Still, trading is at least part of Bank of America’s revenue mix, and it yielded mixed results last quarter. That is, fixed income trading revenue fell 15% to $1.45 billion, falling short of the expected $1.62 billion. Equity trading, however, grew 11% to $1.1 billion. The fourth quarter’s numbers from B of A and the first quarter results from other banks make at least the trading piece of Bank of America’s revenue a coin toss come Tuesday morning. There’s little doubt, however, that all other segments should shine for the bank when it posts its first quarter figures. Consumer banking earnings grew 52% during the fourth quarter on a 1.9% increase in loan business and a 6% increase in credit and debit card business. Net interest income rolled in at 2.48% during the fourth quarter, and JPMorgan Chase just posted a solid net interest income number for Q1 that was mustered against the same economic backdrop B of A had to work with. The tailwind is in place, but to ensure Bank of America at least secures its fair share of growth going forward, it’s launching a variety of initiatives to attract and retain customers. The most significant of those efforts is an overhaul of branches. The company will update 16,000 ATMs, adding interactive technologies that also accommodate activities like paying credit card bills. At the same time, new layouts will encourage longer stays from customers that require more careful, thought-out planning. That, along with the decision to up the bank’s minimum hourly wage, are almost certain to come up during the earnings conference call scheduled for 8:30 am EST on Tuesday. The earnings report itself should be posted around 6:45 am EST. Article printed from InvestorPlace Media, https://investorplace.com/2019/04/bank-of-america-will-likely-beat-on-earnings-expectations/.